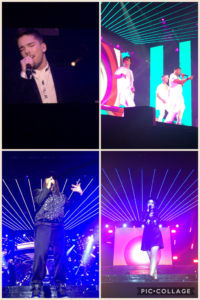 The X-Factor finalists took Liverpool by storm last night as the show returned to the Echo Arena for its annual live tour. Winner Matt Terry and his fellow ‘X-Factor family’ wowed the crowd with their unique mix of solo and group performances. In a show that had two stages, one which was at the rear of the arena, it was boy band 5 After Midnight who kick-started the fun. Having finished third on the TV show, they had great presence showing off not only their talented voices but their hip dance moves. With dancers, pyrotechnics and fabulous lights, their version of ‘Uptown Funk’ had the audience members immediately on their feet. Next, it was the girls’ turn to strut their stuff on stage as Emily Middlemass and girl-band Four of Diamonds displayed their excellent vocals surrounded by lasers and smoke which flooded the stage. All eyes were on Honey G as she walked through the audience to deliver a mash-up of ‘Men in Black’ and ‘Jump’. 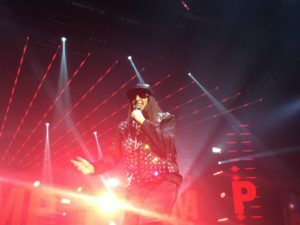 The 36-year-old rapper later performed ‘Ice-Ice Baby’ in a black diamante tracksuit before changing into a silver holographic suit with flashing shades. Excitement filled the room as bands 5 AM and Four of Diamonds joined forces to create a spectacular Spice Girls cover. Sam Lavery, Emily and Saara also shaped another brilliant collaboration by belting ‘No More Tears’ before hitting the main stage together. Last, but certainly not least, the crowd went wild for Matt Terry who closed the show with a selection of stunning performances. From ‘I Put a Spell On You’ to ‘Purple Rain’, he mesmerised the audience who showed their love for the star as they shone their lights that lit the arena up until the very last minute. As the place filled with cheers, confetti, flashes, fireballs and bangs, all the finalists came together to express their thank yous. The X-Factor live tour will show case throughout the rest of the UK and Ireland until the end of March.